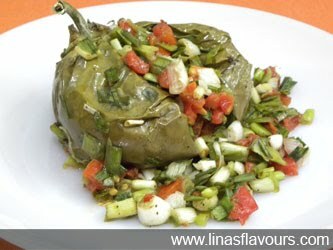 Take two brinjals, grease it with olive oil, salt, pepper, make a slit with a knife in the centre but not cut into half. Put olive oil, salt, pepper into the slit also. Preheat oven and in microwave safe bowl, bake brinjal in Microwave+Grill combo at 300W+Grill for 5 minutes. Till then take a bowl, add spring onions, green garlic, tomatoes, green chillies, remaining pepper, olive oil, salt and mix it well. Take out brinjal, stuff brinjal with mixed vegetables, put remaining vegetables in microwave bowl and bake it for 5 more minutes. Serve it hot with roti, paratha or can have it with curd. Taking out skin is optional, remove skin or have it with it.